Up to the outset of “Hanna”, the title character (Saoirse Ronan) has spent her entire life living an amenity-free lifestyle in a shack near the Arctic Circle with her father, ex-superspy Erik Heller (Eric Bana). Hanna is just your typical 16 year old girl. Her hobbies include speaking multiple languages, hunting elk with a bow, and learning new ways to kill a man. Heller has been preparing her for a fight with CIA bigwig Marissa Wiegler (Cate Blanchett) who is responsible for the little family’s forced hibernation. Soon, Hanna feels she is ready for her challenge and Heller allows Wiegler to be alerted to her presence. After being captured, Hanna’s true abilities are put on display when she kills a Wiegler impersonator and escapes from a high-security holding facility, going on the run to meet back up with Heller. Wiegler pursues and her goon, Isaacs (Tom Hollander), pursue, however, and the result is a tension-filled chase through some of the seedier areas across Eurasia. I can’t ever remember fighting with more vigor to like a movie I ended up not liking than I did with “Hanna.” Going in, I expected to come out with a positive review and I tried really, really hard to make that happen. Alas, it just wasn’t to be. I should note, first of all, that Ronan gives a tremendous performance. A fine actress to begin with, this could be one of those defining roles that dictates a higher-quality of offers as her career progresses. She brings the appropriate mix of creepiness and naïve curiosity that you would expect from a teenage killing machine who, for the first time, has been given an ounce of freedom. Her portrayal is award worthy. I also appreciate what director Joe Wright is trying to do here and there’s no denying he knows how to create a scene. Some of the scenes in “Hanna” are magnificent, particularly the action sequences which mesh a bit of the stylized flash of the “Bourne” series with the more traditional look of older action flicks. But those great scenes are part of my problem with “Hanna.” For me, they are almost stand-alone moments of greatness that don’t connect; there’s no fluidity from one scene to the next. In fact, I often felt that each sequence had a completely different tone than the next, almost like reading a book by two different authors who took turns penning alternating chapters. I get that Wright and his screenwriters (Seth Lochhead and David Farr) tried to capture the conflict between Hanna’s training and the undeniable desire to just be a teenage girl but there’s a real struggle to establish the balance between those two concepts, creating an identity crisis or at least an unsteady tone. It comes across as if Jason Bourne and Nell had a socially retarded love child which is frustrating given, again, how much Ronan gives to the role. In addition, I had a great deal of trouble connecting with any of the characters (outside of Hanna). They weren’t so much caricatures as they were simply inhuman. The hippie parents Hanna comes across during her escape, the strange ally who resides inside a defunct amusement park, and the vicious bad guy who is certainly creepy but only to the extent of a CBS procedural…none of them are relatable. Wright brings to the audience’s attention more creeps and weirdos than have been seen on screen since “Freaks.” That would be fine if they were compelling or even disturbing characters. Instead, they are just confusing and distracting, which brings me to the score. 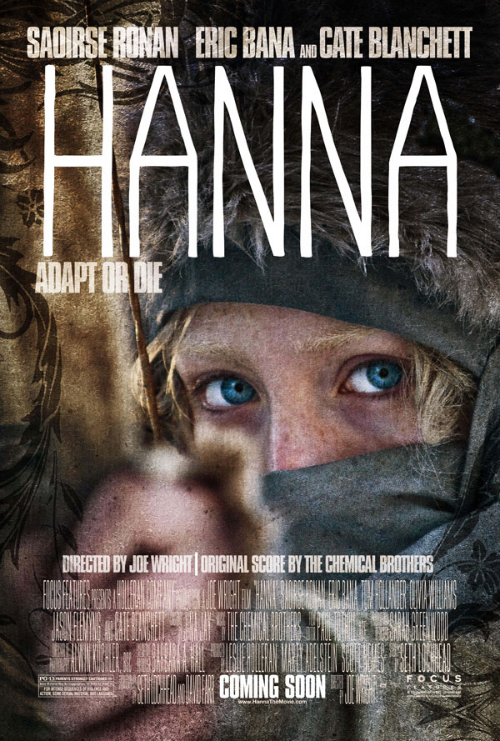 Never in my life have I been more distracted by a score than I was throughout “Hanna.” Let me clarify: I quite liked the score and I’m generally a fan of the techno/progressive score that has become popular lately. When used correctly, I think there’s no questioning the asset a score like this one (done by the Chemical Brothers) can be for a film. It’s just used horribly. Really, it’s not just the score. It’s the shot selection, lighting, and various production elements combined with the score that completely ruined “Hanna” for me. Wright doesn’t use the score to drive his film; instead, he blows your eardrums out with it and even makes a point of highlighting it. One scene in particular, when Hanna escapes from her prison, feels like it was designed with the specific intention of playing to the score rather than the other way around. The overwhelmingly loud sound mix is obnoxious and the flashing lights/scene cuts are to the level of inducing a seizure. Maybe I’m just getting old but I’m not kidding when I say my head was pounding upon leaving the theater. These were huge missteps in my opinions, not to mention exceedingly distracting. 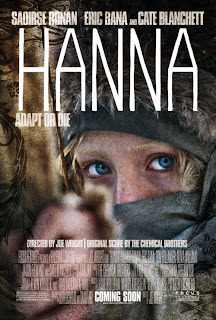 In the end, “Hanna” is, to quote the Bard, “full of sound and fury, signifying nothing.” I can’t call it a bad movie; not with Ronan’s fine acting performance and some truly awesome scenes (not to mention the positive reviews of many people whom I trust). I just hate it. It has a strong story and an excellent concept, to be sure, but the execution is porous in my book and I could not get over the potholes in the road it travels. Care for a second opinion? Check out Cinema Slants much more positive (and probably more accurate, given the buzz around my favorite blogs) review here.